We’ve located some copies of this amazing, long-out-of-print book that currently sells for a minimum of $75 and as much as $218 online. Now you can purchase the remaining copies from Feral House directly for $35 apiece. Mushroom men. Gargantuan Space Turtles! Evil Brains from Outer Space! Colossal Cuttlefish! 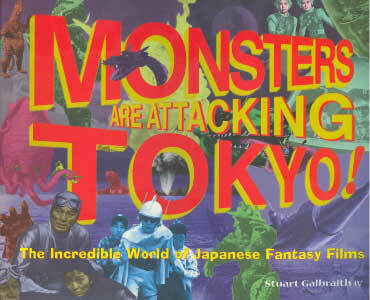 They’re all here in Monsters Are Attacking Tokyo! With more than 200 photos and 50 interviews with the brilliant madmen behind and in front of the camera, Monsters Are Attacking Tokyo sifts through the goofy and grand, with behind-the-scenes info on the wildest and most misunderstood movie genre of them all. What did well-regarded directors like Akira Kurosawa really think about this disreputable genre? How did monster movie actors feel about being upstaged by guys in rubber suits? How did Japans’ special effects wizards create those incredible scenes of mass destruction?